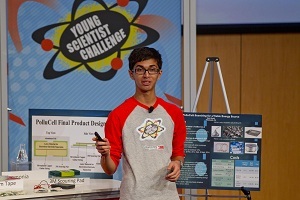 week, Sahil and 9 other incredible finalists came together in St. Paul, MN, to present their one-of-a-kind innovations and compete for the $25,000 grand prize and title of America’s Top Young Scientist. Sahil developed an innovative, eco-friendly battery design inspired by the 1.2 billion people worldwide who lack access to electricity and the rising levels of toxic air pollution. He was determined to create an energy storage device that could help lower harmful greenhouse gases while generating enough electricity for those in need. His prototype – the PolluCell – converts carbon dioxide into electricity, ingeniously helping to reduce our carbon footprint while offering power for household uses and developing nations. Watch all 10 finalists’ presentations at www.youngscientistchallenge.com/live-event – check it out today and prepare to be amazed! Do you know America’s 2015 Top Young Scientist? The 2015 Young Scientist Challenge will be launching soon. Visit www.youngscientistchallenge.com for more information – you never know, someone you know may be America’s 2015 Top Young Scientist!